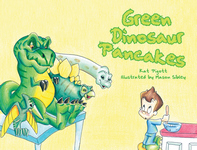 In Green Dinosaur Pancakes Kole discovered Nana’s pancakes come to life and the strongest survive their morning spats! 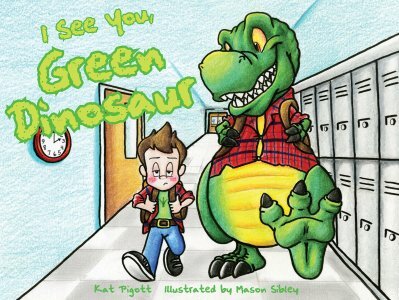 In this sequel, the green T-Rex just won’t leave Kole alone. When Kole encounters a school bully, the prehistoric pancake helps him out of a sticky situation. In this anti-bullying tale, Kole and the green reptile stand up to the bully and learn that a little kindness can go a long way. Author Kat Pigott offers a timely lesson and talented teenage artist Mason Sibley provides appealing characters in this encouraging story. Author Kat Pigott founded several charitable organizations including Kid’s Kitchen. Recognized by the Louisiana governor for her dedicated community service, Pigott is an active member of the SCBWI. She consulted with teachers and counselors for this book. Mason Sibley began drawing characters when he was eight years old. A popular presenter at schools and conference, Sibley is an honor roll student and was named Student of the Year at Springfield Middle School. This is his second collaboration with Pigott.